Between July 25 and July 26, 2009, my husband and I visited a few local shelters and saw nearly 1000 deserving potential companions. 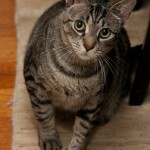 We were looking to adopt two male cats 2 years old and younger, whether littermates or not, with sweet temperaments. As much as we were enamored with the kittens we saw available for initial fostering and adoption, we realized the advantages to adopting older cats. It’s not an easy decision when there are so many needy lovable faces with only two spots available at home. We were also blessed that both our previous cats were so good natured; their successors would have quite the big shoes to fill. The morning of July 26, 2009, we planned a three shelter route for the day. 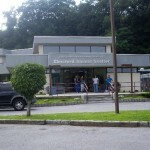 Elmsford Animal Shelter had an earlier opening time that we made it our first stop. EAS was located down an unlikely industrial service road. It was a big facility from the outside and was very much as pictured on their website. I was amazed that I had not known of an animal shelter in this area. The town of Elmsford was fairly well known to us. We walked into the lobby and I admired the rabbits in their hutches. A couple of paces away were cages upon cages of cats against the right side wall. Sad sleepy faces poked out to greet the visitors of the day, wondering if today would be their lucky day for a forever home. I carefully walked along the endless rows of cages methodically as to not miss any worthy critter. I estimated the feline residents to total 400+ (two to three stacked cages with at least two bunkmates each and 5 cat community rooms filled with rugs, a sofa, shelves, and toys). Though EAS had limited resources, like most other shelters, they seem to allocate those resources wisely. Paid and volunteer workers alike toiled tirelessly throughout the day to ensure their residents were well taken care of. We saw non-stop cage cleaning, distributing of treats, and even one-to-one attention. My descriptions don’t do it justice. We headed out the back rooms towards the front again. My husband and my gaze sort of rested on the same cage simultaneously. Their names were Frick and Frack, a black male domestic short hair and male brown tabby respectively, both estimated at 2 years and 2 months of age. The veterinary technician read their chart and said they had been rescued October 6, 2007 at 5 months old from someone’s basement. A hard and slow to socialize start in life left them feral. The vet tech told us that a kind and patient volunteer had dedicated much of her time to playing with Frick and Frack, hoping to get them out of their shells. Frack was eager to greet us with the cage door closed while Frick became more animated with the cage door opened. We filled out an adoption application but needed more time to give the decision the consideration it deserved. We drove to another local shelter, saw several kittens and young cats, but no one was really standing out to us. The day was wearing on. How many more shelters would we have to visit? How many more faces to see? As much as seeing new faces could be exciting, the truth was they were all in need of good homes and all equally deserving. So yes, why not them? We hurried to the bank for more cash to “post bail” and Petland for a scratching post and zipped back to Elmsford before closing time. The vet tech smiled upon our return and we happily said yes to Frick and Frack. While we were waiting for the vet tech and her assistant to prepare our new kitties for us, I looked back at all the little faces and hoped they would soon be as lucky. My husband and I played with many of the other residents along the same wall as Frick and Frack with a string toy. We were happy to see many cats jumping up and down trying to grab the toy as it approached their turn. In the excitement, I could hear the vet tech say to Frick and Frack, how happy she was for them. Into the crates they went- Frack was silent, Frick gave a little cry. They were off to their new home…..
*Frick renamed Jakob (Jake) Emerson- Why? I love the name Jake. The Jakes I have known were always kind-hearted and Emerson from Ralph Waldo Emerson; a distinguished name for my magical cat =). *Frack renamed Outlaw Pete (O.P. 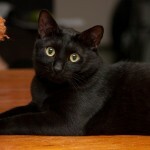 or Opie for short)- Named after a Bruce Springsteen song; my husband is a big fan! Opie’s my little big meatball =). Jake loves his catnip-stuffed fleece fortune cookie toy and carries it in his mouth throughout the house.